would say obsessed with !! 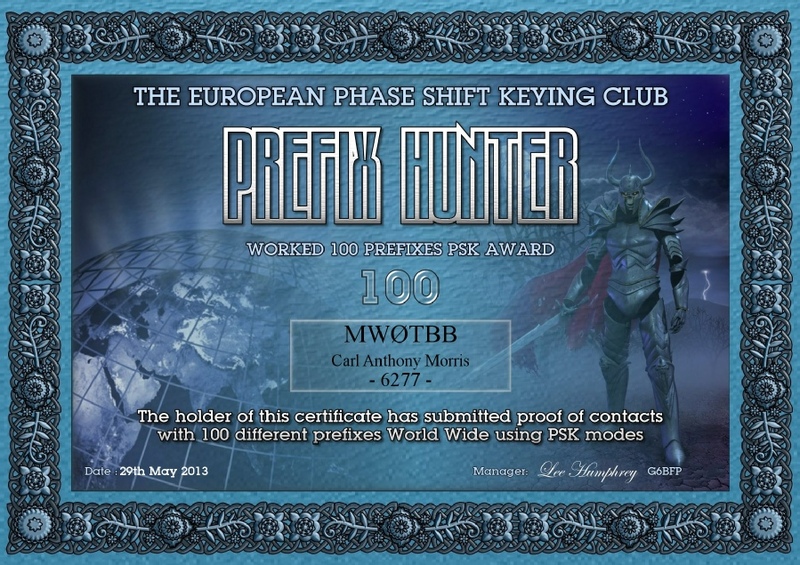 PSK31 is a digital mode I really enjoy, it is easily accessible if you use Ham Radio Deluxe as there is a pre installed program called DM780. Obviously it is a text based communication, it is a good mode for QRP operation as operators can see in the waterfall if you are calling CQ CQ CQ MW0TBB/QRP etc. You don’t even need to be a fast keyboard operator as the text entry is mainly macro based, the macros pick up your station information etc from the initial detail you input during the set up of the DM780 program. 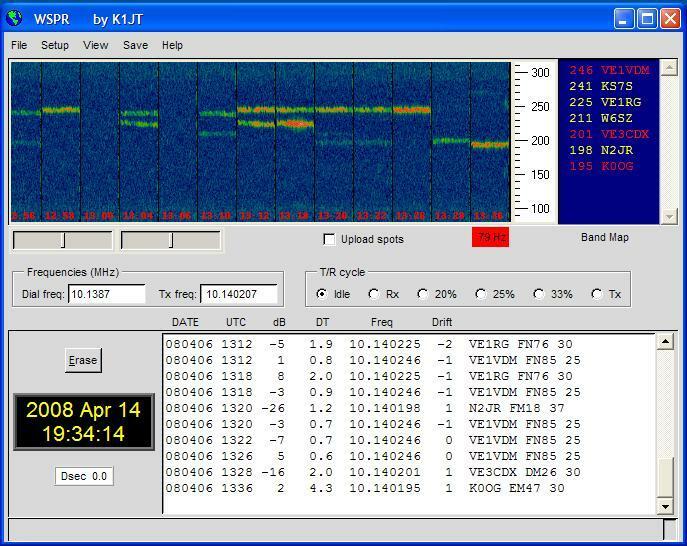 The first image below is a screen grab of a PSK31 session being received & the second is a transmission of PKS31, you will notice that in the transmit mode you can only see your own data in the waterfall being displayed. 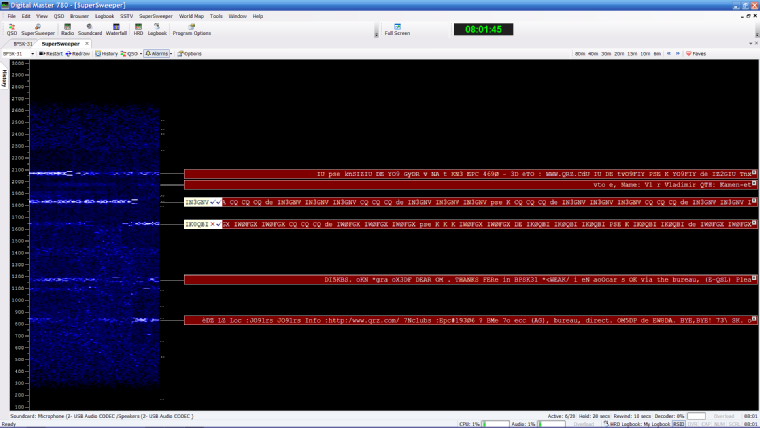 When in RX mode you just place your cursor on one of the data streams and it will start to decode on your screen in the top section of the DM780 screen. You can also view a broad section of the waterfall and simultaneously decode the streams in the super sweeper tab. A bit tip with this program is to read the manual & closely follow the sound card settings, keep your ALC control as low as possible when transmitting to avoid splattering your signal. 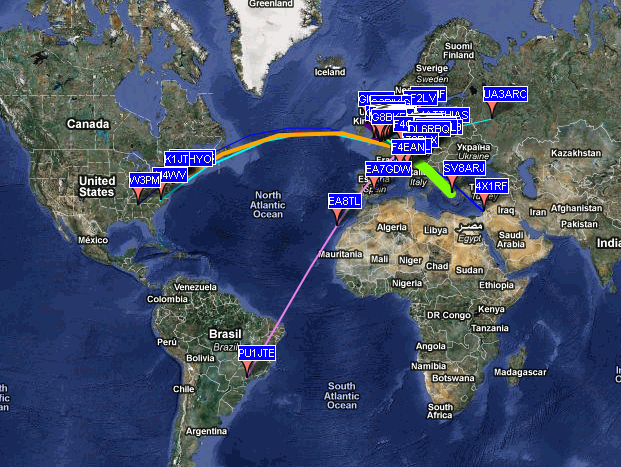 It is amazing the results you can get on a low power signal, I would recommend the mode to foundation licensees as world wide communication on the HF bands is well within their grasp using this mode. 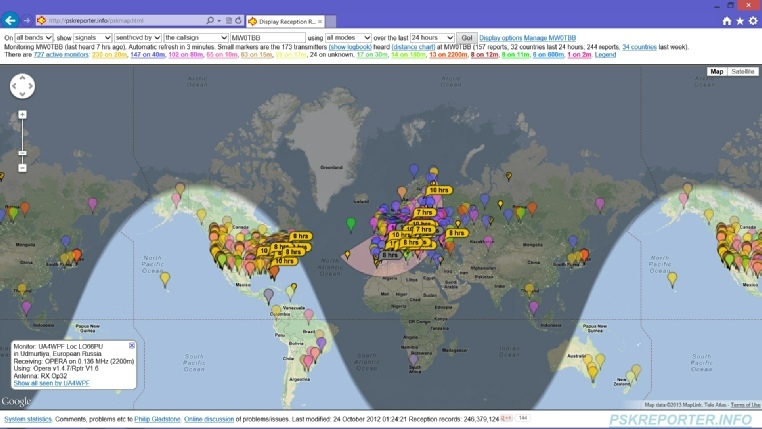 You can monitor your reception over a period of 24 hours on the PSKreporter web site, it’s useful as you can set a number of filters up such as band, mode & callsign if required. 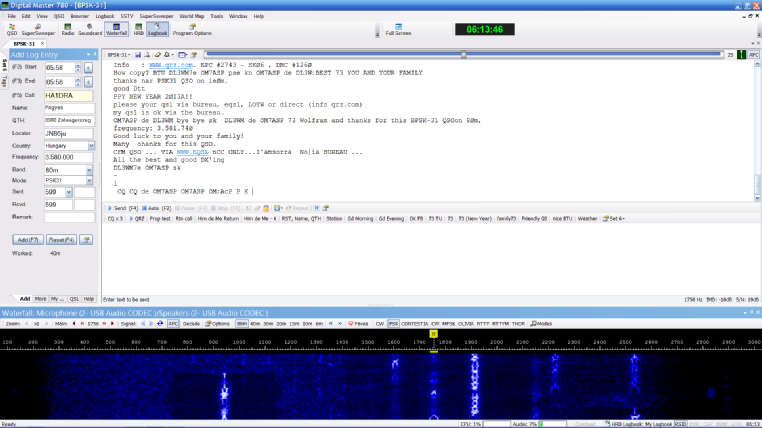 PSKreporter is also built in to Ham Radio Deluxe but I usually just keep the web page open in the background. If you use an iPhone you can also download an App called Ham from the app store, it will also give you similar reports on a more limited text based level. 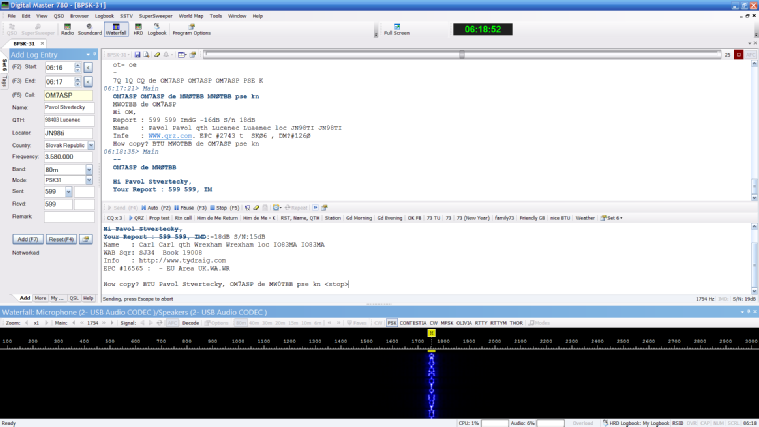 Another great digital mode is WSPR "Weak Signal Propagation Reporter", a program written by Joe Taylor, K1JT this is excellent for QRP and is what I would call a passive mode as you can set up your HF equipment and shack PC and let it operate by itself, you can then sit back in the shack using your VHF/UHF rig to chat away to your hearts desire. All of the HF work is done by the PC, with some thought it should also be possible to build very simple beacon transmitter possibly using something like a Arduino module. Some information on this kind of project can be found here. The most important thing with this software is making sure that your PC time is updated regularly by a reliable time server. The mode depends on synchronised transmission and receive cycles to work. If you do not get any decodes after installation this is the first thing to check. You can install a time server update program, I have personally not found a need to do this as my time server appears to be acceptable.